NOTE: One free youth with one paid adult ticket. Youth age 7-12. Under 7 free. Listen to WIN your way to the WPCA Chuckwagon Races! The World Professional Chuckwagon Races are in Saskatoon June 7-10 and you could be going for free! The VIP Prize Package, awarded through our partner radio stations, includes two general admission tickets, two youth admissions, a one-night stay at the Parktown Hotel in Saskatoon and a $75 gift certificate for any concession, bar or dining outlet at Marquis Downs! Make sure you are listening for your chance to win your way to the Races! Over the course of four days, 36 drivers will compete in heats of four Chuckwagons. 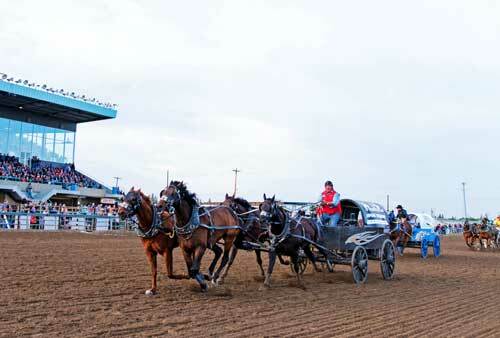 The top chuckwagon in the standings at the end of the weekend wins the Saskatoon World Chuckwagon Races Championship! With over 500 thoroughbred horses, the talented drivers and outriders of the WPCA are sure to put on a thrilling show! ALL AGES EVENT - FREE PARKING! Our Offices are closed Saturday & Sunday. Email : agmanager@saskatoonex.com with inquiries.